The pressure over Constitutional Carry is getting hot as we approach the Senate Sub-Committee tomorrow at 12:00pm! I wanted to make sure you knew that just yesterday, the Iowa State Sheriff and Deputies Association (ISSDA) came out beating their tired gun control drum and are officially opposing Constitutional Carry. This is not a surprise, as they’ve opposed Constitutional Carry and Stand-Your-Ground law for a decade. That said, please remember this when their renewal letter arrives in your mailbox in about a month! Of course, the ISSDA was always able to count on Senator Gronstal and Senator Sodders to do their bidding — until IGO members removed them both from office last year! But that doesn’t mean they are giving up easily. More, just a few hours ago the national gun control group run by former Congresswoman Gabby Giffords had their lobbyist in the Capitol ‘declare’ against this bill as well. Insiders report to us that Giffords and her Political Action Committee may weigh in heavily, trying to stop this bill from advancing! 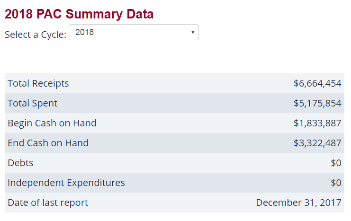 Filings from the end of 2017 show that Giffords PAC has over $3,300,000 cash on hand, meaning that she certainly can afford to spend money to try to stop us! As I’m sure you know, Iowa Gun Owners will not be able to compete dollar for dollar against Giffords and her friend Michael Bloomberg in an all-out ad-war on radio and TV. As I told you last week, we are already preparing for a focused ad buy in targeted districts — where we know that they will be the most effective. But we are going to need your help to be able to make this ad buy happen. Already we are spending heavily to generate calls and emails in the Senate to advance this bill via email, direct mail, and social media marketing. To be able to put together a hard-hitting radio and TV program will require us to spend money that is already being allocated elsewhere. That’s why I hope you’ll consider an immediate donation to Iowa Gun Owners of either $100 or $50. I know that’s a lot. But as a member of Iowa Gun Owners you have a front row seat (literally, for those who are attending the sub-committee hearing tomorrow) in helping us fight for the Second Amendment. You’ve seen how your support allowed us to run a massive campaign to expose gun-grabbers like Mike Gronstal and Steve Sodders — with devastating effectiveness. And last year, you again saw how your resources lead to the passage of our long fought for Stand-Your-Ground law! So won’t you consider making another contribution — right now — to help us advance Constitutional Carry law? We don’t have to compete with Bloomberg or Giffords’ PAC dollar for dollar. And having been around for a decade now, fighting for the Second Amendment, we know exactly which districts are going to need a little extra pressure if this bill goes to the floor. I don’t know about you, but I’m sick and tired of out-of-state special interest groups from NYC or DC sending their lobbyists into the Iowa Capitol and telling us how much Second Amendment freedoms they think we should enjoy. Gun owners in Iowa have spoken loudly and clearly, by removing dozens of anti-gun lawmakers over the years across the state. Now, with these historic majorities, is our best chance at advancing Constitutional Carry law. Please make a donation today, so that we can have the resources we need to fight for you if this bill goes to the floor for a full Senate vote! And don’t forget, if you want to observe or testify in favor of Constitutional Carry law tomorrow, we would love to have you join us! The hearing takes place at 12:00pm in Room 22. To get there, go to the far South entrance of the Capitol and take the elevator you’ll find next to the security station up to the Second Floor. When you get off the elevator, turn right and you’ll see Room 22 at the end of the hall. But either way, please consider helping us prepare for an all out fight over Constitutional Carry law — with a generous donation today. P.S. Constitutional Carry is gaining steam every day in the Capitol, thanks to your support. As we expected, the tired ISSDA has come out opposed to your gun rights and this bill. More, former Congresswoman Gabby Giffords’ national gun control group has now declared in opposition to this bill and they are gearing up for a fight to stop us. As we prepare for a radio and TV effort to support this bill, we simply must have your support. This is our best chance to pass this bill in years — don’t let some elite liberal from NYC or Washington D.C. dictate how much freedom you can enjoy here in Iowa. And remember – you’re invited to the sub-committee hearing tomorrow. All the information is listed above! Constitutional Carry Hearing This Thursday!